View More In Furnace Filters. 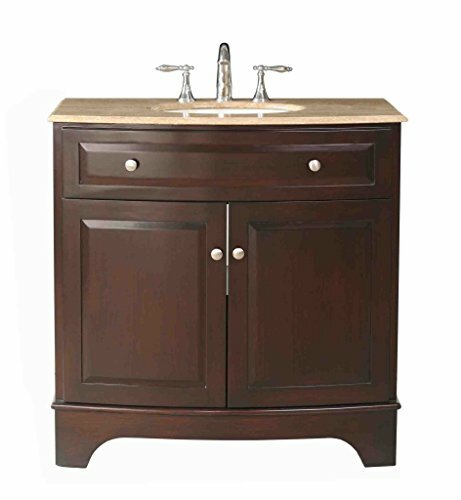 36" Amanda Single Sink Vanity With Travertine Marble Top and MirrorA complete package, the 36â€ Amanda Single Sink Vanity and matching mirror offer storage, sleekness and plenty of style. At home in nearly any design, from modern to traditional, the aesthetic appeal of the Travertine Marble Top is heightened by the rich cherry finish of the two-door cabinet. The mirror also features doors on either side for additional storage options. Features:â€¢ Adds sleek sophistication to any bathroom spaceâ€¢ Includes stylish cabinet and drawer hardwareâ€¢ Ample storage space for toiletriesâ€¢ Allows for easy plumbing and faucet installation*â€¢ Handcrafted and hand-finished Details:â€¢ Alluring modern sink with dark cherry red polish and two door large storageâ€¢ Contemporary vanity single sinkâ€¢ Mirror includedâ€¢ 3 pre drilled faucet holesâ€¢ Cabinet is supported by two broad legs on both sidesâ€¢ Huge cutout back for plumbing installationâ€¢ Interesting wall mounted mirror with two covered cabinets and an open rackâ€¢ Shining semi circular knobs on the doorsâ€¢ Two door cabinet with shelf for storageâ€¢ *Faucet sold separately â€¢ Ivory white undermount sinkDimensions: 36 H x 22 W x 36 L inches*Faucet not included. If you have any questions about this product by Stufurhome, contact us by completing and submitting the form below. If you are looking for a specif part number, please include it with your message.